In a previous blog entry I mentioned the case of a Sunbed salon owner in Wales having been fined for flouting the rules on safety in his establishment. His defense is that the rules are somewhat more strict in Wales, unlike the rules he is used to in England. The rules he refers to are the ‘thin end of the wedge’ in that, in reality, they are semantics. Cleaning sunbeds between patients and providing them with protective glasses are the least of the sunbed users problems. The pictures shown above serve to remind us of the real danger of sunbed use. 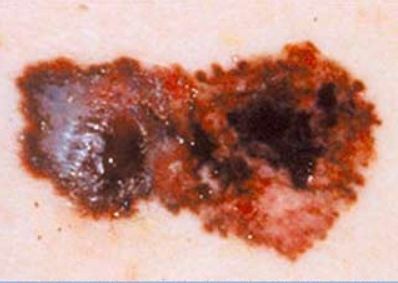 The first is a developing melanoma with its characteristic multi coloured appearance, irregular shaped and spreading are common features in developing skin cancer. 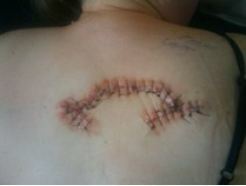 As an example of the devastation skin cancer can cause, look at the second picture. This is the excision margin of a patient who had a melanoma the size of a pencil rubber. The wide excision margin is the result of the surgery necessary to clear the margins of tumour. Melanomas are deadly with the average survival for anyone being diagnosed with a malignant melanoma being measured in months! The graphic below from a Skin Cancer Focus Group shows the problem. Unlike many cancer types, the incidence is highest in the least deprived group in both males and females. This is mostly because of many more affluent people taking multiple foreign holidays in the sun. Those at the other end of the graph tend not to travel as often or as widely (sunny climes) This group tends to be the group which utilises sunbeds in salons the most. The evidence is well established for the association between sunbeds and skin cancer. When you talk to a skin cancer sufferer they will frequently comment on how preventable their cancer was. 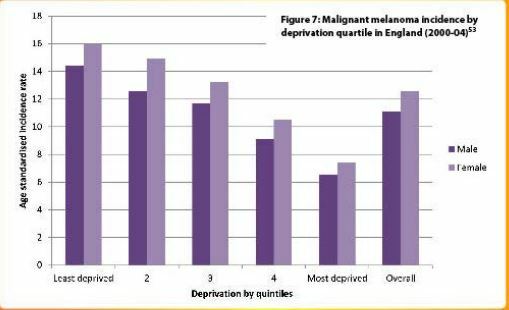 Sadly it is too late when you get a malignant melanoma with life expectancy only 6 – 9 months from diagnosis, to do anything positive about preventing the chance of getting skin cancer. If you want to reduce the risk of developing a serious melanoma. ditch the sunbeds and be very careful about over exposure to UV rays when on holiday.